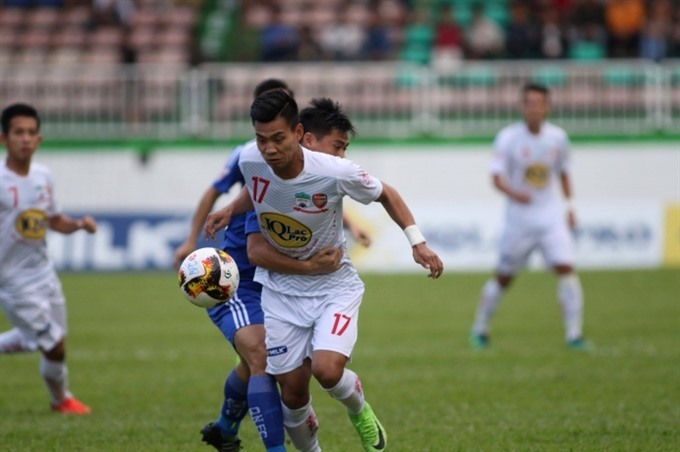 HÀ NỘI — Hoàng Anh Gia Lai (HAGL) defeated Quảng Nam 1-0 in the 11th round of the V.League 1 at the Pleiku Stadium on Sunday. Taking full advantage of playing on the home turf, HAGL competed confidently, creating repeated chances to score goals from the first minutes of the match. HAGL fielded many young and skilful players, threatening Quảng Nam’s with shots by Văn Thanh, Châu Ngọc Quang and Nguyễn Công Phượng. However, no goals were made in the first half. After the break, the hosts continued their attack. Quang opened the score for the hosts in the 51st minute. Quảng Nam also tried their best to level the score, but they failed. With this result, the hosts HAGL maintained their 11th place ranking, while Quảng Nam also maintained their third position. At the Lạch Tray Stadium in the northern port city of Hải Phòng, Hải Phòng tied 1-1 with Sông Lam Nghệ An. Striker Steven opened the score for the hosts in the 10th minute, while Nghệ An’s Văn Đức levelled the score after 13 minutes. In other matches played yesterday, Khánh Hòa bested Đà Nẵng 1-0 and Bình Dương crushed HCM City 1-0.